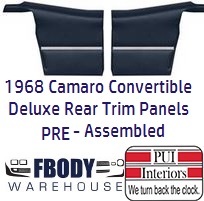 This is a pair of new replacement deluxe rear interior trim panels for use on 1968 - 1969 Camaro with DELUXE interior and COVERTIBLE models only. These are FULLY ASSEMBLED and ready to install! 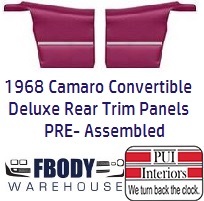 This is a pair of new replacement deluxe rear interior trim panels for use on 1968 -1969 Camaro with DELUXE interior and COVERTIBLE models only.